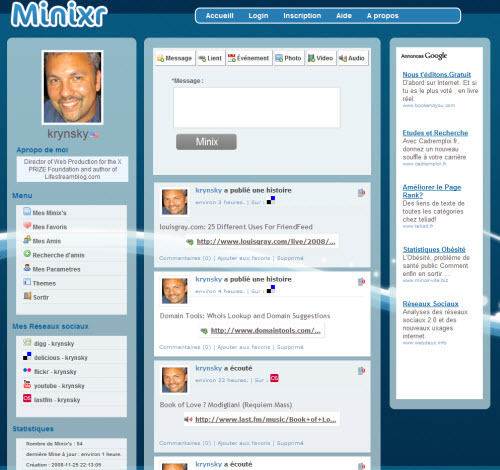 New post over at startuparabia.com alerted me to a new service called Minixr being launched out of Algeria. They called the service “a mix of Pownce and FriendFeed” and after playing with the site for a while, I totally agree. After creating your account you can have it import and aggregate your data from 10 sites which include Digg, Reddit, Flickr, YouTube, Seesmic, Delicious, Diigo, Smugmug, Vimeo and Last.fm but no ability to add your own RSS feed. If you are a user of Pownce you will notice a very distinct familiarity with the UI. The top is highlighted with a posting bar that includes the same items such as message, link, event but omits file in lieu of photo (local upload), video (provide YouTube link), and audio (local upload). Below the posting section is a reverse chronologically ordered list of items that are either aggregated from your imported services or created locally on the site. The items also bear an uncanny resemblance to Pownce even down to the link listings. You can also comment, favorite, and a link to send status updates through mobile phones or IM services such as Google Talk, Jabber, AIM but I didn’t try out those features. The site is currently in beta but you can sign up now and is expected to launch in January of 2009. It’s currently in French, but they plan on adding English soon. Overall it’s a nice looking service and if you’re a Pownce user you will feel right at home and wonder why the importing and aggregation features haven’t been added on the Pownce service yet after they work so well on Minixr. If you signup and need some help translating French from the site you may want to use Babelfish. Thanks Mark for the article, I'll go and check out Minixr. How long do you typically try out a new service, before deciding to sticking with it or moving back to your favorites? (regarding regular interaction). Alistair, I try all services because I'm obsessed with Lifestraming and do it so I can write about them for the site 🙂 That being said, I think you need to define what you want to get out of your Lifestream before you decide on choosing a service. You mention interaction. I currently do most of my interaction on FriendFeed which has built itself focusing on features to interact with others. I like recently launched Storytlr with regards to being able to fully customize a feed to your liking. If you run a WordPress blog then you should check out the Lifestreaming plugin which is great. I import all of my feeds available to Facebook so I can reach my friends that don't use other services so I can share my Lifestream with them on their own turf. So basically choosing a method or service to Lifestream should be determined by what you ultimately want to get out of it. Also, remember you don't have to choose just one form. It's easy enough to go down multiple paths. The fact it's in French has halted me in my tracks. 🙂 Ashamed to say my language skills are poor. But am intrigued by the service nonetheless, certainly keep my eyes open on this. Thanks for the in depth answer Mark. I keep getting back to friendfeed, as it is the most comprehensive so far. I'm also doing a lot of 'listening' at them moment as I haven't decided where I want to go with Lifestreaming.